An exhibit in the London Museum should be of interest to those who look for hatchments in our churches and elsewhere. The exhibit bears an inscription at the foot which reads as follows: “Oliver Cromwell’s scutcheon that was taken from his Hearse ye 23rd Nov. 1658.” The whole (background and coat of arms) is painted on silk. It is now mounted on wood, framed and glazed, but it has evidently for a long time been folded into small compass, for there are three distinct transverse folds and a vertical fold — not shown in my drawing, which is an endeavour to copy the heraldry alone. As explained by the Museum, this funeral escutcheon bears the Protectoral Arms of the Lord Protector (who died on 3rd September 1658), impaled with those of his wife’s family, the whole surmounted by the Royal Crown, but I understand that it is not mentioned that the background is black behind the Protector’s Arms and white behind his wife’s, to indicate that the wife has survived the husband. 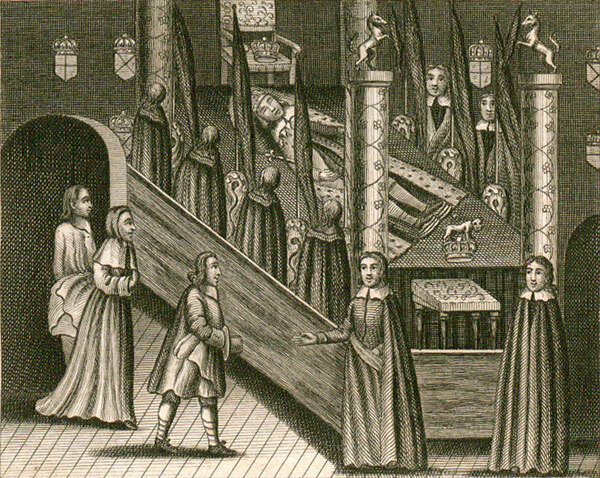 Although Oliver Cromwell was never crowned nor given the title of King, yet he was nevertheless the Sovereign of this realm for a number of years before his death, and his funeral was exactly like that of a king, and the wax effigy that lay on his coffin had a crown on its head and an orb and a sceptre in its hands. Lord Macaulay says in his History of England (Everyman’s Library, I, 113) that Oliver Cromwell was “laid among the ancient sovereigns of England with funeral pomp such as London had never before seen, and … he was succeeded by his son Richard as quietly as any King had ever been succeeded by any Prince of Wales”. It will be noticed that the crown has four arches, as in the case of the crowns of James I and Charles I. The dexter half of the shield, as on the Great Seal and coins of the Protectorate, is quarterly of four: 1 and 4, argent, a cross gules; 2, azure, a saltire argent; 3, azure, a harp or, stringed argent; with an escutcheon of pretence bearing Cromwell’s personal coat: sable, a lion rampant argent — being Arms for the name Williams, Cromwell being by paternal descent a member of a Welsh family of that name. The sinister half is the coat of Bourchier, viz., sable, three leopards passant in pale or; Cromwell’s wife being Elizabeth, daughter of Sir James Bourchier, knight, a wealthy merchant of Tower Hill, London, who had an estate at Felsted in Essex where he ordinarily resided. 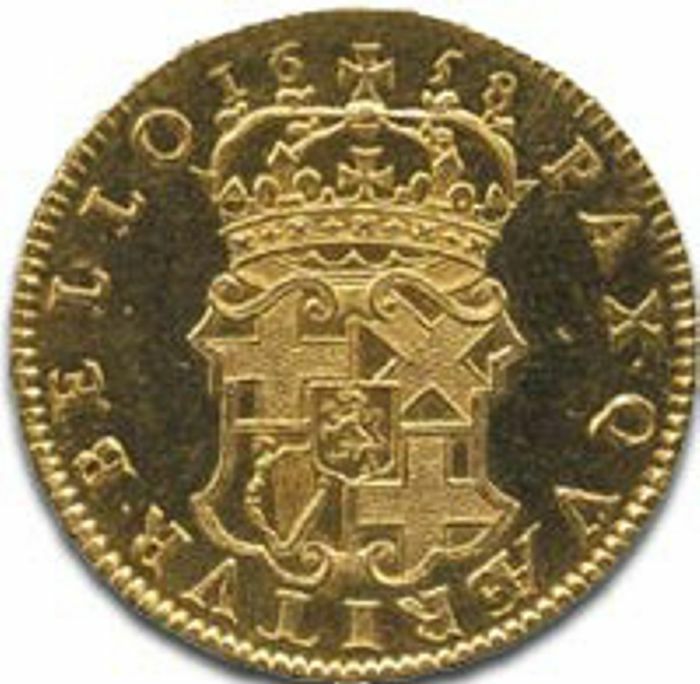 It is well known that the Great Seal of 1655 included the royal helm, mantling, crown and crest, also a crowned lion guardant and a Welsh dragon as supporters of a shield bearing the crosses of St. George and St. Andrew, the Irish harp and the Cromwell inescutch¬eon. Instead of the motto, “Dieu et mon droit”, Cromwell used “Pax quaeritur bello” (If you seek peace, prepare for war). The Garter finds no place in the achievement.